Our Instructor's Desks and Science Lab Workstations feature expansive work surfaces where teachers can demonstrate lessons, and groups of students can absorb what they see and immediately apply it in an experiment. 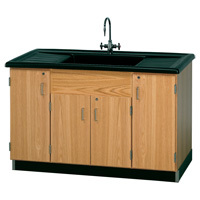 These workstations and tables offer available chemical-resistant countertops, built-in fixtures and accessories, as well as lockable cabinets and drawers so you can store, retrieve and operate your lab equipment in one space-saving place. 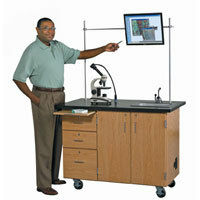 Set up an Instructor's Desk or Lab Workstation in your science classroom and make the most of your limited work area.